Proven combination of BAR B Q and DELTA TEXAS, this is a high quality lineage. 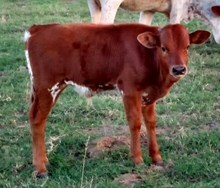 Her dam, Delta Texas has not had a bull calf to date. Horn tips rolling over now, slow but steady. Her first calf is a heifer, will she continue her dam's legacy of only having heifer calves? Only time will tell. Now being exposed to JBR Cash.